Build a durable raised bed planter with this easy, tool free kit. Assembly takes just minutes. No tool necessary. Raised beds are made from 1.5 inch thick kiln-dried cedar protected by a non-toxic silica-based sealant that is safe for vegetable gardens. Choose from three different sizes, in standard or rustic grade cedar. Enjoy long-lasting raised beds, season after season, with a 30-Day Satisfaction Guarantee and 5-Year Limited Warranty. 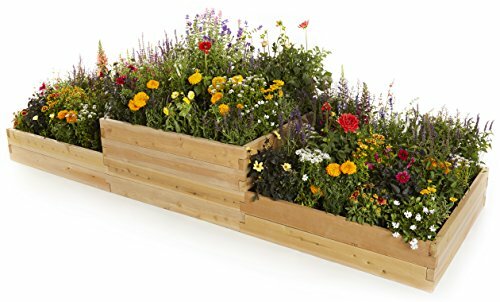 Assembled dimensions: 23.8" W x 68.4" L x 22" H; holds 11.4 cubic feet of soil. Made in the USA. If you have any questions about this product by Naturalyards, contact us by completing and submitting the form below. If you are looking for a specif part number, please include it with your message.